As far as I can tell, the boat came from the factory with 3 – 8D batteries located between the stringers centred in the lazzerette. 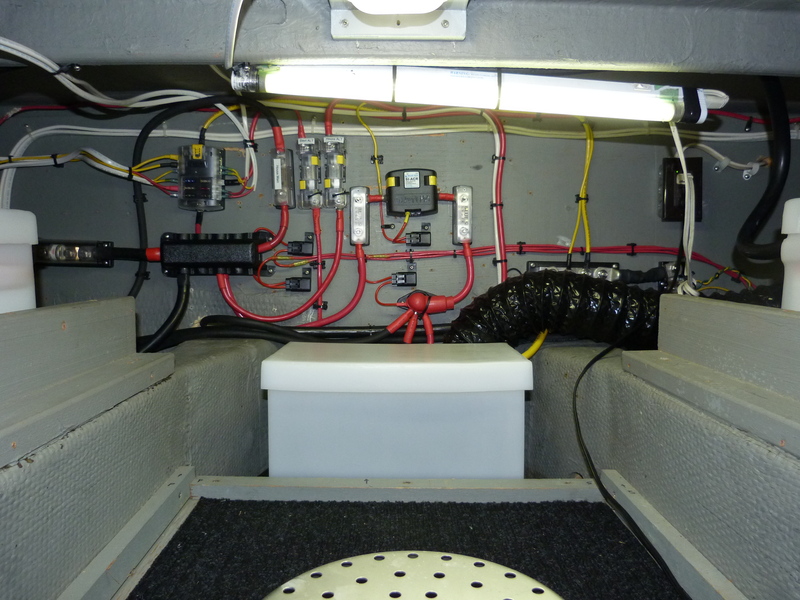 One 8D was wired just for the port engine (starting) the other 2 were wired for the starboard start and house bank. We had a house bank of about 650ah or so and yes we did drain that down while anchored last year. 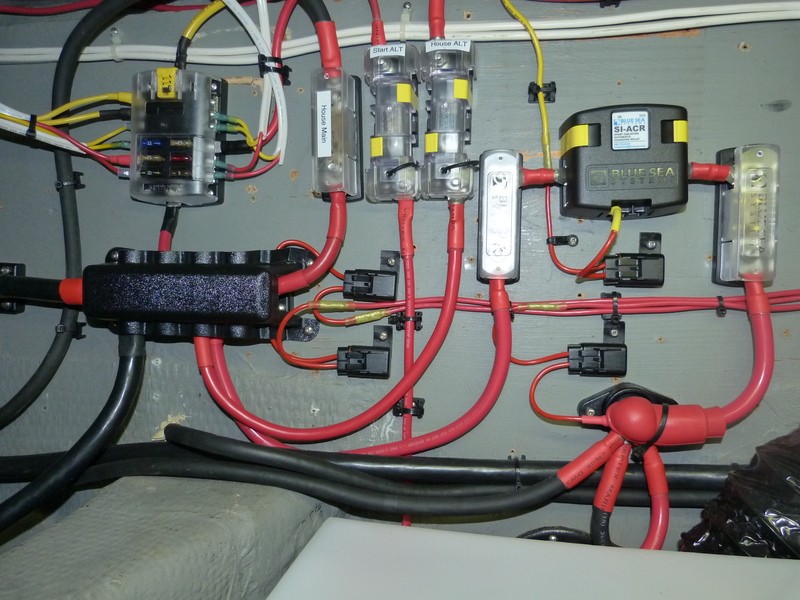 Charging these 8D’s (while cruising) came from both engines wired to an old charging combiner and then to each battery. This seemed to work OK but I do not think the batteries were ever fully charged with this method. 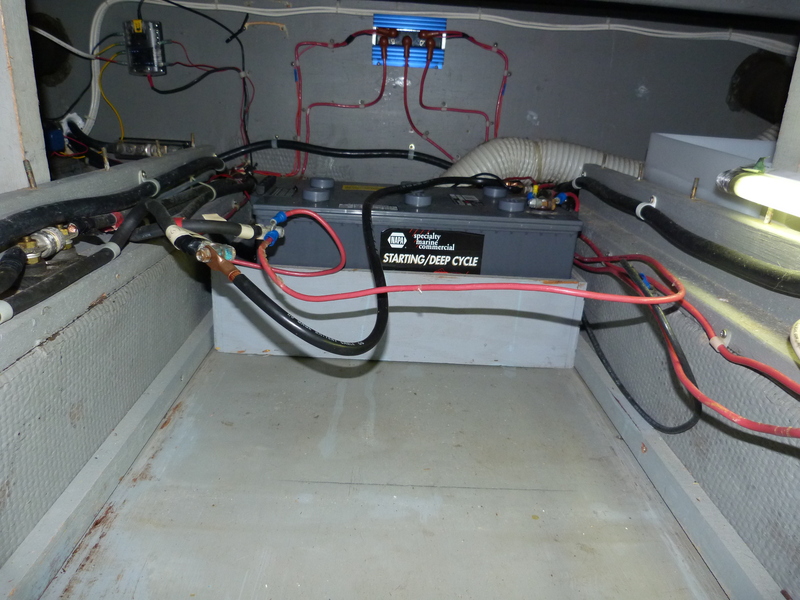 At some point the previous owner added a Xantrex Prosine inverter/charger and powered this with 4 – 6V Golf Cart batteries. These were located between the outside stringers, 2 on each side. 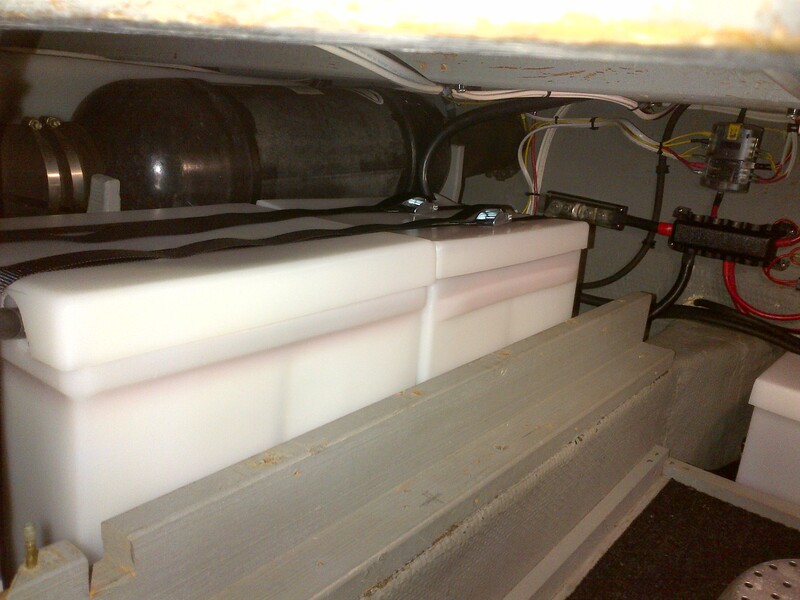 This was wired as a complete seperate battery bank dedicated to the inverter only and only charged by the Xantrex. Everything seemed to work OK but we lacked the ability to charge the Golf Cart batteries with the engine alternators (remember we don’t have a generator) and we lacked the ability to properly monitor either battery bank. 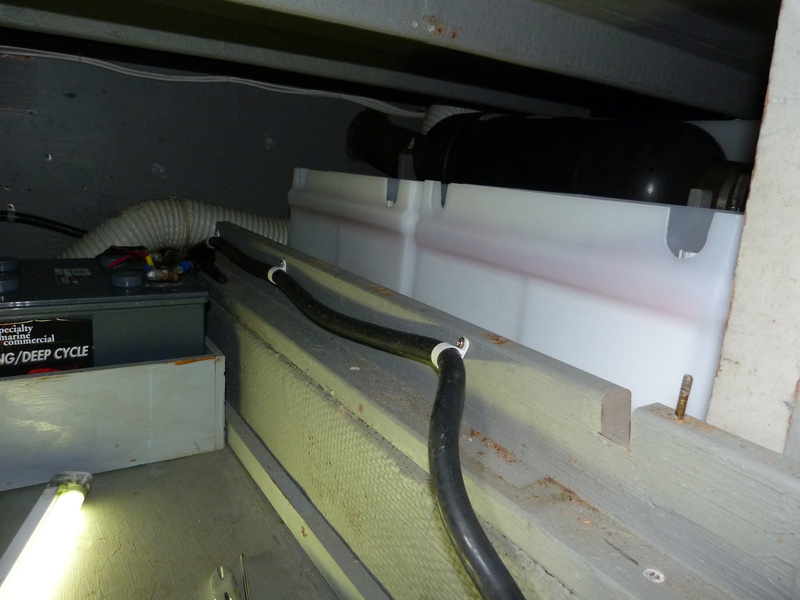 Another issue was we could not completely isolate the “House” bank from the “Start” bank. The 8-D’s were 8 years old and were on the list to be replaced, so this all led to a re-design and upgrade of the entire system. 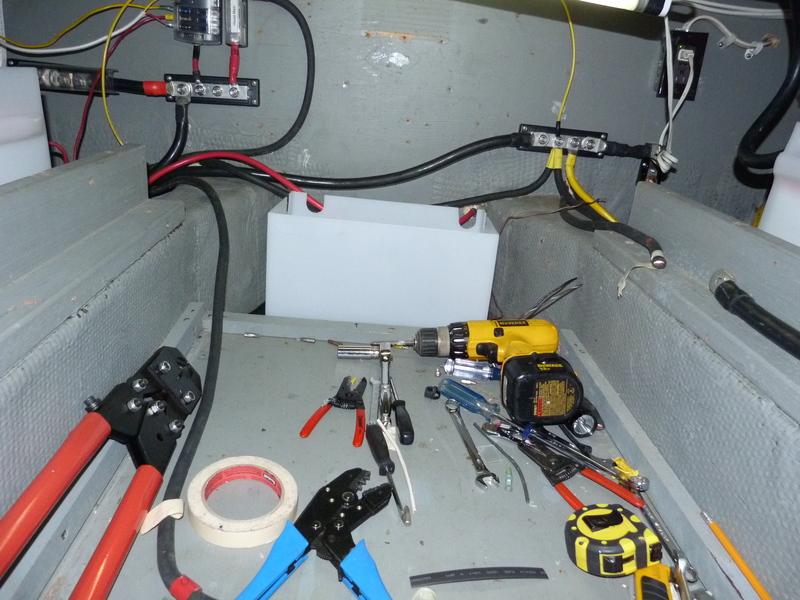 By increasing the new “house bank” to 8 – 6Volts this will give us just over 900ah of standby power, should be plenty! This new combined House Bank will use the inverter/charger for AC charging and I could eliminate the OLD – GIANT – NOISY pro mariner. Some people call these old chargers “battery cookers” because they are single 60 amp chargers that just BLAST a charge at the batteries. More modern chargers are 3 stage and will make batteries last longer. Well, we have one of those, so why not use it ! 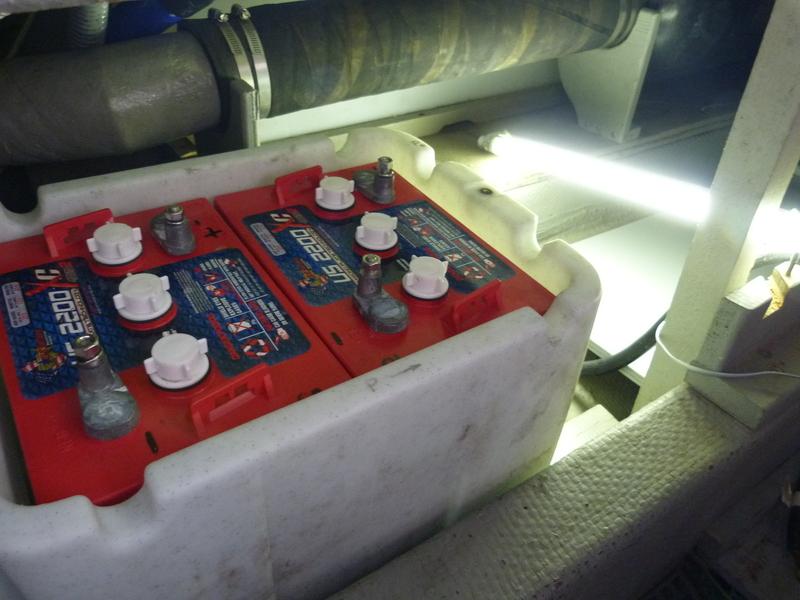 Next I thought If I could move the location of these batteries, 4 on each side, to the outside stringer space this would free up a huge amount of storage space where the 8D’s were. I constructed heavy duty plywood shelves to fit the batteries on . The shelves are fixed and are quite solid. 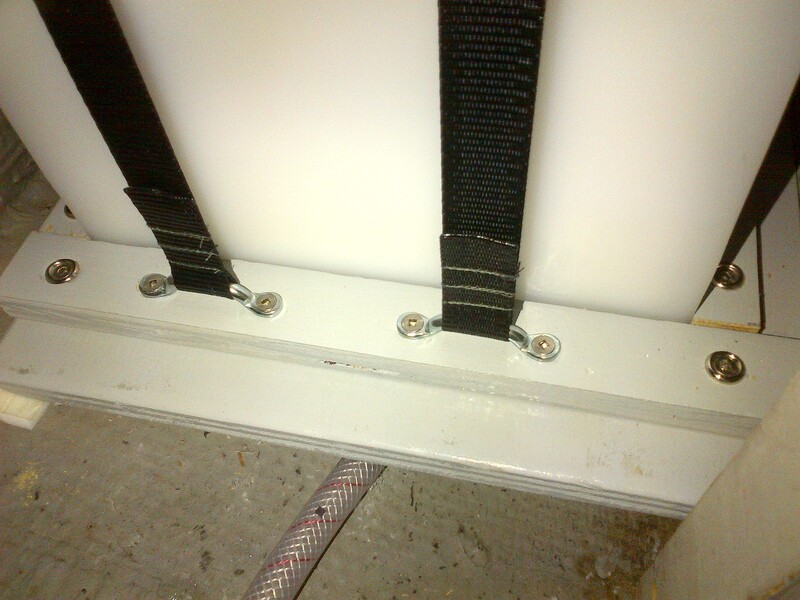 The batteries in their boxes slide in place from the lazzerette and are held in with cleats and nylon tie downs. Blue Sea ACR. This will combine and then isolate the Start Battery from the new House Bank. I found and removed a few wires that were unused and a added few runs that needed an upgrade. I was able to re-use most of the heavier cables by shortening them and crimping new lug terminals. 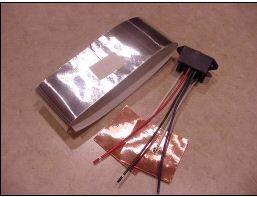 Shrink tube was used on all cables and wires. I did increase the size of the main house bank alternator and it’s cable. 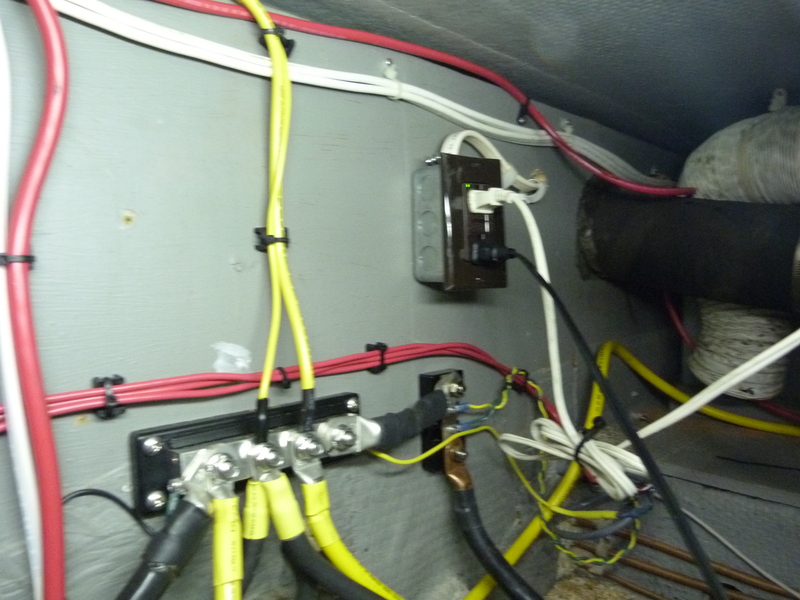 I added fuses where there were none to bring the wiring up to today’s standards. Almost Finished. That’s a Group 31 Start Battery in the box. As usual, there were a few more things to add. 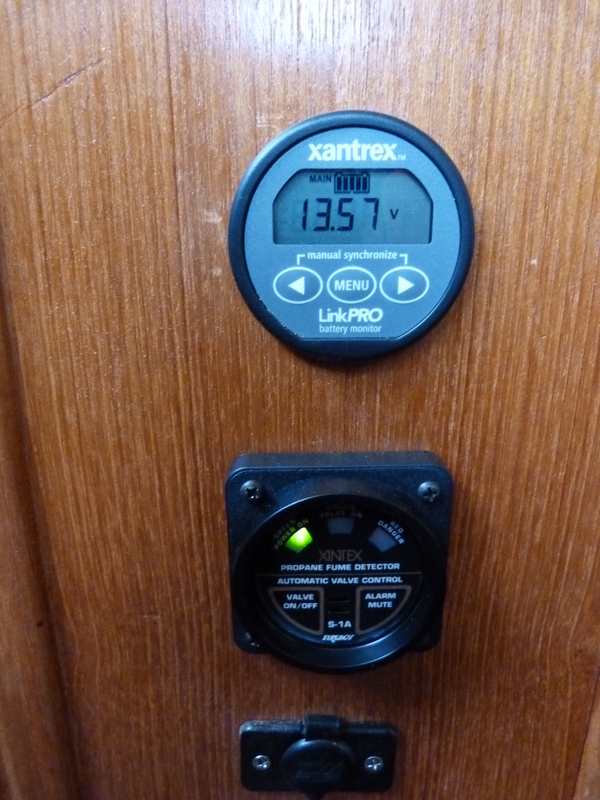 To be able to monitor the House Bank I added a Xantrex Link-Pro. 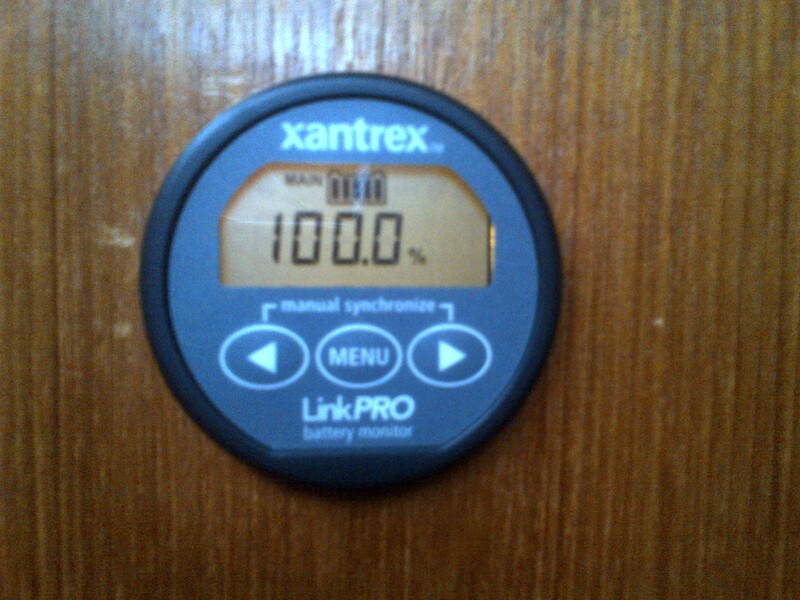 This will give us all the information we need to properly keep track of our usage and battery level. It even monitors the Start Battery Voltage. One thing leads to another…….. 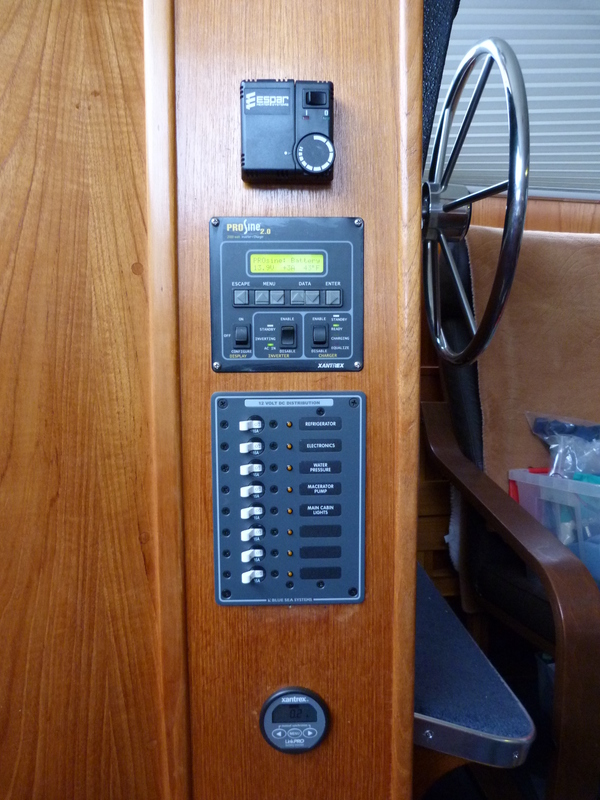 Unlike many other models of Tollycraft, our 34 did not have a separate 12V distribution panel. 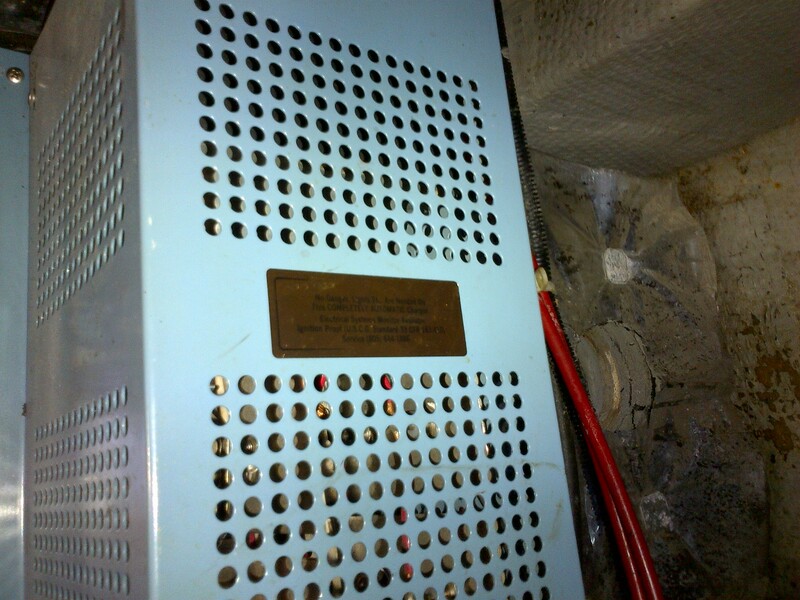 Many of the circuits were simply fused from a main fuse panel. Some had single switches but many were not switched at all. I wanted to clean this up and be able to switch circuits, so I added a Blue Sea 8023 panel. To make room for the new panel I removed the old water tank level gauge (it never worked) and re-located the Espar Thermostat Control. 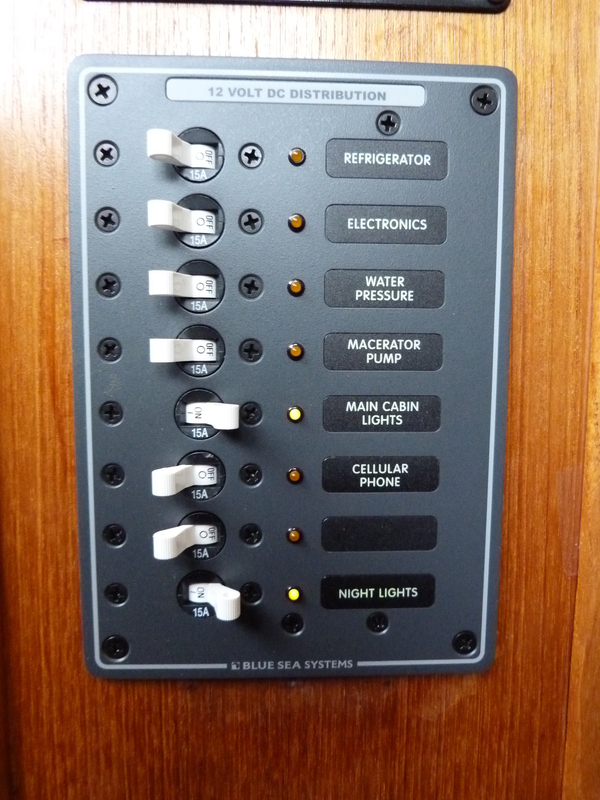 While identifying and changing circuits over to the distribution panel I tested each device and circuit. I found that the LP Gas sensor was not working correctly. We’ve had several false alarms and I suspected that the solenoid was not closing properly. 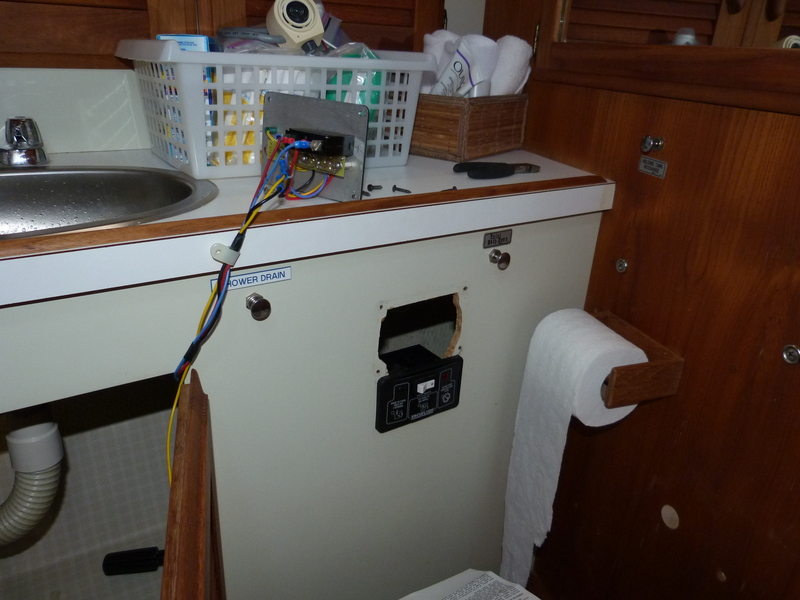 I installed a new LP gas sensor and solenoid control and relocated it from the cabinet wall in the head to a more convenient location easily reached while in the galley. 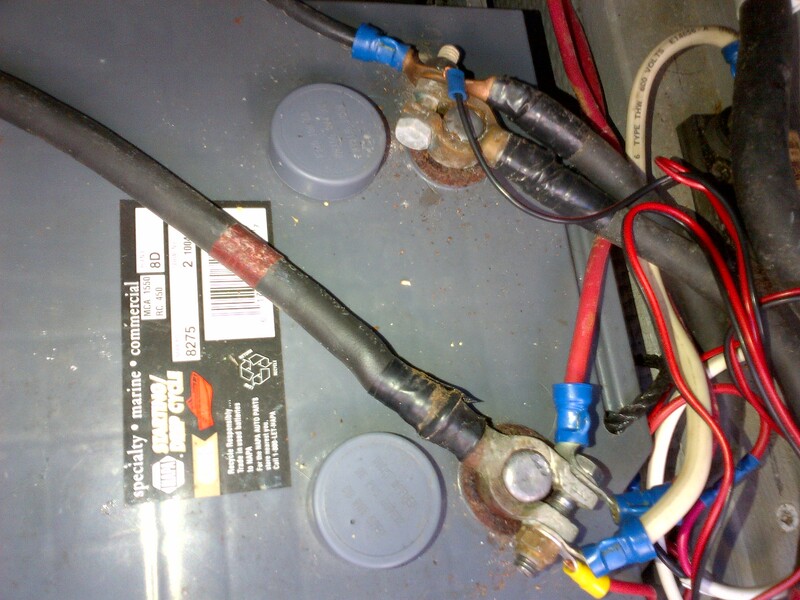 This solves 2 issues and updates the solenoid and alarm! Perfect ! Of course this left a huge hole in the vanity cabinet in the head…. So………………. I made a custom aluminium panel. 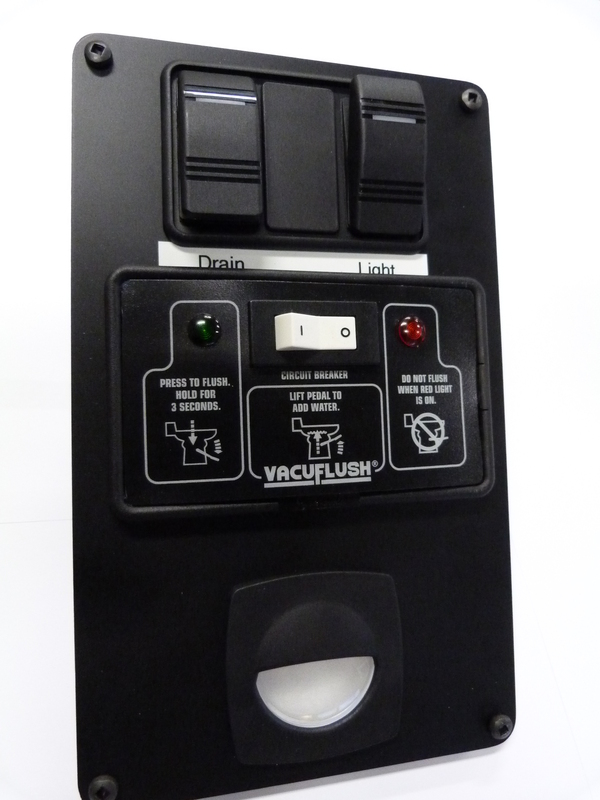 This houses the VacuFlush control, a switch for the shower light, the shower drain pump and I added a “night light”. It covered the hole nicely . “Well, you’ve got the whole boat ripped apart and tools everywhere… you might as well keep going. This project is taking a long time”……. I thought it would be nice to have a working monitor for the Water Tank so…. I found a company that makes a sensor and panel system that gets great reviews. Ferriello make these sensors under private label but sell for a few dollars less on their website. 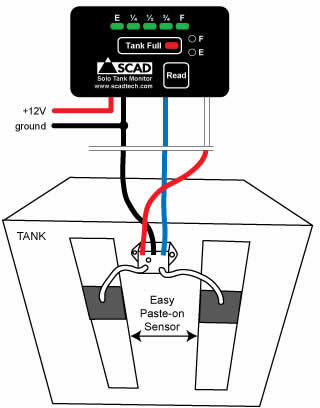 This panel reads the tank level from a sensor mounted on the outside of the poly water tank. 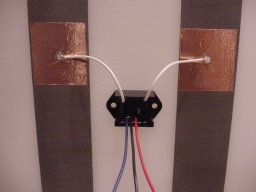 2 strips of aluminium are attached vertically spaced 3″ apart and 2 copper contacts are adhered to the strips. I have a feeling that this project is not over just yet but that’s it for now at least. Check back in a few weeks and see if I have added anything else….. you never know what I might find at the BOAT SHOW !!!!!! 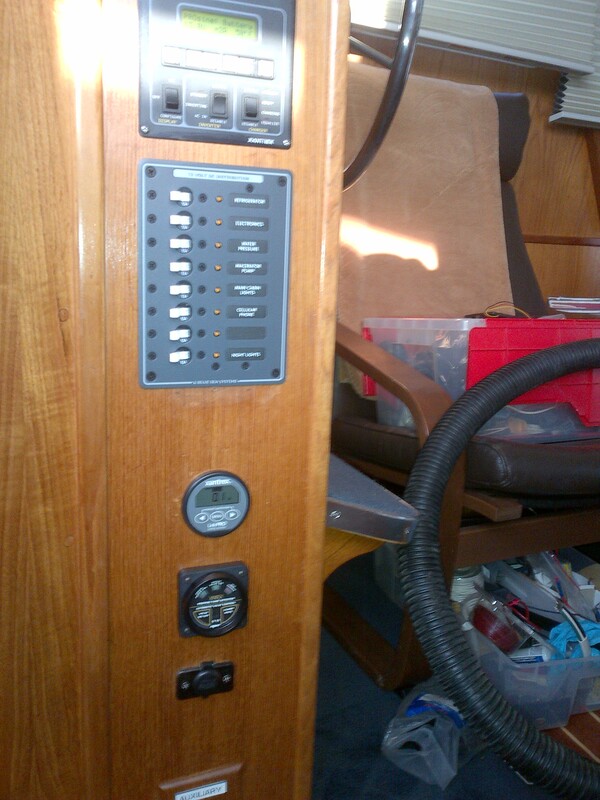 This entry was posted in Boat Projects, Tollycraft 34 Projects. Bookmark the permalink. Just read up on your electrical update. Awesome! Loved reading it. I want to do a smaller version of updates on my 30′ sport. I also dont have a 12v DC panel and I hate that. 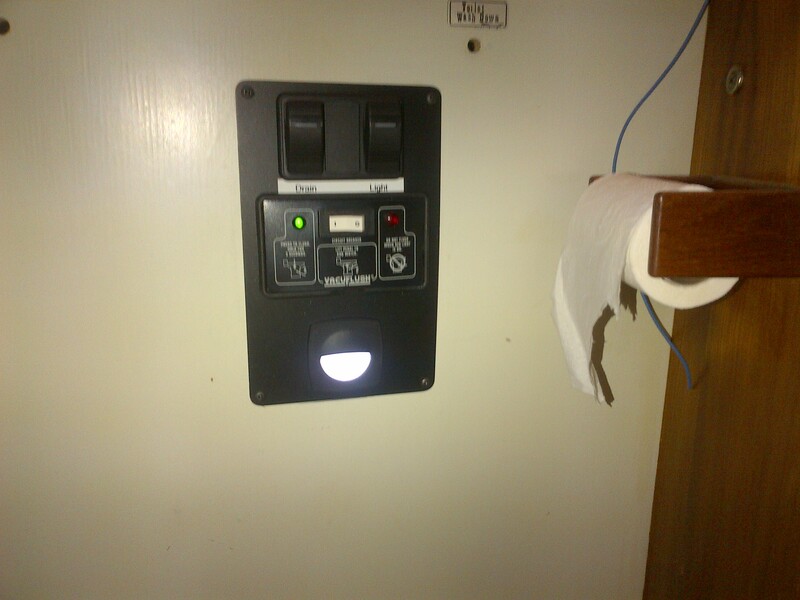 So i have a question….. Why did you need to install a propane alarm? Do you use propane on the boat for cooking or something? Thanks for sharing your upgrades.Your giving me some new ideas too. Yes we have a propane stove and oven. 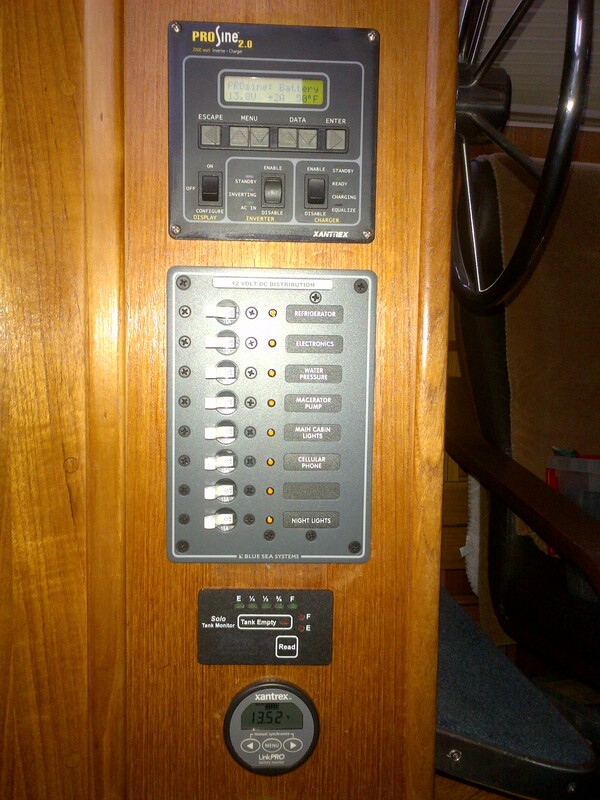 That was standard equipment on the boat. we did have an alarm as well I just updated it to a newer version. Great post. After owning our boat for a year and a half (it took me this long to figure out our electrical system) I’m about ready to make some upgrades. 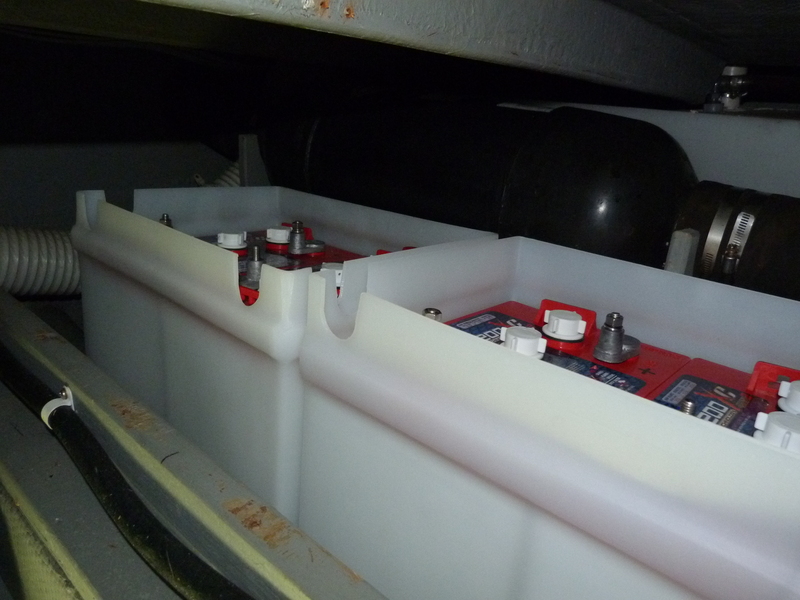 We have two engines, four banks (start, house, inverter, generator start), and a generator. 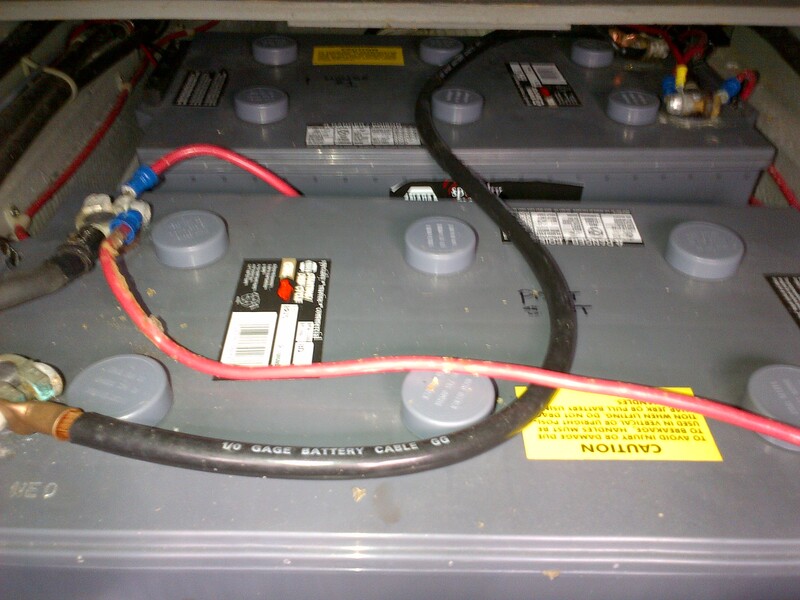 Our house bank is an under-powered 8D (240 Ah) and our inverter bank is four overpowered golf cart batteries (840 Ah). I think I am going to follow your approach and consolidate the house and inverter banks into one big bank. Back when the old owners watched big screen TVs and cooked with a George Foreman grill, all that AC power made sense. In the age of 2.1-2.4 amp USB devices it’s kind of a waste – and I’d like all that extra DC power for my fridge. Thanks for the inspiration and ideas.